Today when I got home from work I was a little bummed because the confirmation to photograph MGMT's gig tonight didn't come through. I don't mind too much - I mean I was excited to shoot them but I understand that this is the nature of what I do. My mood quickly cleared into one of absolute happyness when my sister said to me "guess what I found today when I was about to throw out the crimper box". She then proceeded to hand my my Lord of the Rings ring that I thought I'd lost almost 3 years ago. I'm so happy right now I want to burst! This is a ring I bought way back in 2002 (I'm guessing) and used to wear every single day (prior to thinking I'd lost it). Both my sister and I were 100% wrapped up in the LOTR phenomenon. We were so involved with it that we (with 2 of our friends) travelled to New Zealand in 2003 and made sure our trip corresponded with the final premiere for the Return of the King in Wellington. We spent a day of our holiday waiting on the barrier of the red carpet watching the parade of elves, orcs and hobbits walk by before getting our photo taken with Dominic Monaghan, shaking hands with Sir Ian McKellen and being called "precious" by Andy Serkis (in the voice of Gollum). 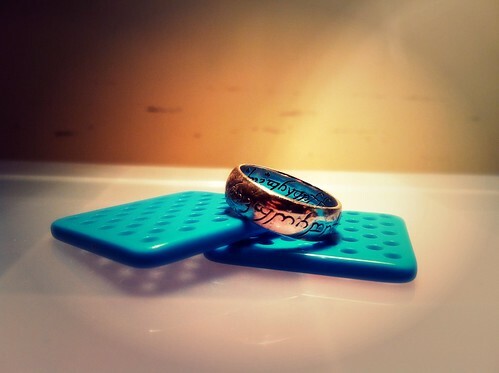 It was the beginning of our overseas adventures and this ring was a constant reminder of that adventure. I can tell you what I was doing on the day that I thought I'd lost it - I was getting ready for my work ball in July (2008?) and noticed that the ring was missing when I met up with my work mates. I remember thinking that it must have fallen off my finger in my Mum's car because I was carrying a bunch of things that I'd need for that evening. I searched Mums car high and low and ripped my room apart to no avail. I was devestated. I've thought about the ring now and then - I even went searching on ebay to try and get another one but when I did that it just felt wrong. You just can't replace something like that. I feel so happy to have it back on my hand - back where it belongs. I love that I have it back. Tomorrow night I'm going to see Mark Ronson (and hopefully photograph - pending confirmation) so I'm sure I'll be back before the end of the week with photos and stories. It's also a long weekend this weekend with lots and lots of fun things planned. P.S My hair is not "proper" purple yet because I'm still waiting for the dye to arrive. The place I normally order Special Effects from had some issue with the supplier and they told me it should be here mid week. I'm hoping tomorrow (even though I haven't received a shipping notice email) so that I can dye it on Thursday (my day off). I think I need to find somewhere else to buy it from - this is the second time in a row they've taken forever and I'm sick of having to chase it up with them. Recommendations??? I don't care if it's International at this point they'd be much quicker than the place I'm currently buying from.